Winmate's E430M2-3B2 and M700DT4-RF rugged industrial mobile computer offers field computing, communication and data capture capabilities in a heavily ruggedized handheld that bridges the gap between conventional industrial handheld and smart phone functionality. These devices are capable of running Android platforms, GPS and extensive communications and data capture (RFID) options provides field worker with advanced technology in rugged form factor. Inspection of high voltage power line tower is a crucial task to ensure continual power delivery; any damage in one tower can be catastrophic to affected areas. For this reason, the aim of high voltage power line towers inspection and maintenance is to provide reliable method for field managers to track operators to ensure inspections are conducted correctly and to generate accurate on-site report for safety reason. 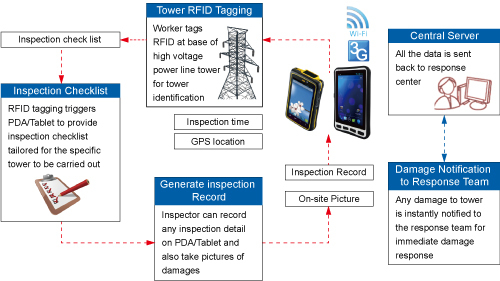 Therefore, to enable reliable and automated inspection, RFID and GPS technology are needed for collecting and synchronizing inspection information to the central server to provide fastest response time if damage occurs.